The Champagne region of France is less than 100 miles east of Paris and is made up of the Aube, Marne, Haute-Marne, and Ardennes departments. It is easily accessible by car or train. There is a small airport at Reims (Reims-Champagne Airport) and another in Troyes, and both cities have rail access. Summers in the Champagne region are quite nice, and spring offers the best in wildflower viewing, but real wine connoisseurs will find the best time to go to Champagne is the fall, during the harvest season. One thing to bear in mind when traveling by public transport is that the vineyards are often not near train or bus stations, you'll often need a car. But cars need designated drivers, and who wants to visit a vineyard and not drink?! As a result, if you want to visit as a day trip, I would recommend a guided tour. 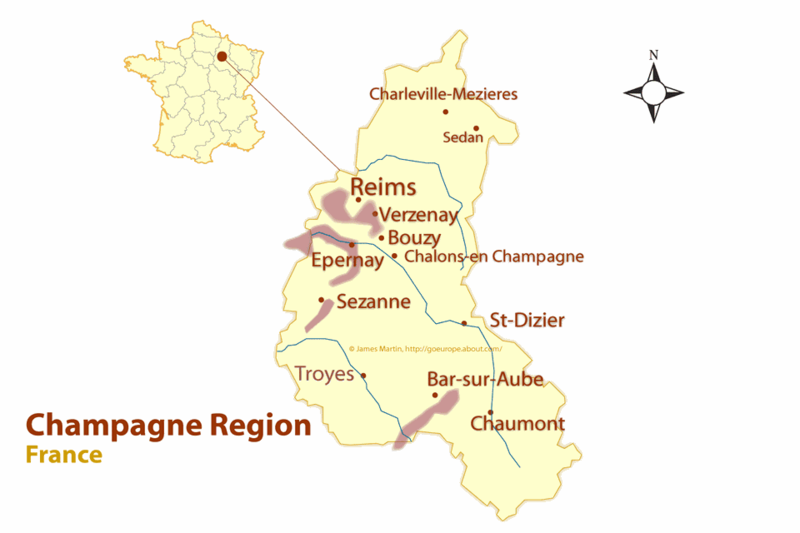 The main vineyard areas are shown in purple on the map with the largest concentration--the Marne Valley, the Mountain of Reims, and the Cote de Blancs--around Reims and Epernay. Reims is the biggest city in the area so tends to be where most visitors head to. It also has a nice cathedral, so it's worth visiting in its own right. From Paris: You can take the train from Paris to Reims. The journey takes approximately 45 minutes. You sometimes need to change in Champagne-Ardennes or Epernay. There are trains from around 8am, with the last train back at around 8pm. Reims is the capital of the region, and you'll find many opportunities to taste champagne here, as well as visit the renowned Notre-Dame Cathedral with its circular stained glass window, called a rose window, and the 1974 set of stained glass windows by Marc Chagall. There are 11 champagne houses in Reims, with Maxims, Mumm, Piper-Heidsieck, and Taittinger offering public tastings. Maxims is right in town, a short walk from the center. You may also wish to consider Epernay, which also makes an excellent base for exploring the champagne route. The local cellars are listed on the Epernay Tourism website. Sample Champagne Without Leaving Paris! If you aren't really interested in seeing the winemaking process, why not do a champagne tasting session in Paris instead? The vines of Champagne take root in a great layer of chalk under a thin layer of fertilized soil. The Champenois vineyards are planted only with Pinot Noir, Pinot Meunier, and Chardonnay grape varieties. It wasn't until the late 17th century that the tart wines of Champagne became sparkling wines. How do you find artisan champagne? Look for a bottle marked "R.M." (Recoltant-Manipulant) or "S.R." (Societé-Manipulant). Those initials signify that the grower vinifies, bottles, and markets Champagne from grapes he grows. For more about the wines of the Champagne region, see our guide to Champagne and Sparkling Wine Basics. As in any wine region, the food is excellent in Champagne. Sedan has the largest chateau fort in Europe. It's worth a visit, especially if you stay in the hotel in the castle. There is a Medieval festival the third weekend in May. Troyes is a lovely city in the south of the region of Champagne. Troyes' old quarter, with well-preserved and sometimes slanting 16th-century half-timbered houses lining the pedestrian streets, is quite charming, and the restaurants and bars offer a good value in this rather expensive region.